The number of ladies' tailors in the capital city had reached 10 by 1905, reflecting the newer fashion for ladies' suits and tailored coats. The Columbus ladies' tailor represented with a garment in the collection has the label M. Pollatsek, Ladies Tailor, Columbus, Ohio. Born in Hungary on March 17, 1870, Max Pollatsek, along with his wife Johanna, immigrated to the United States in 1894, and by 1903, he had established a ladies' tailoring business in Columbus. While only Max's name appears on the garment label, Johanna was also listed variously as a seamstress or ladies' tailor in several city directories. The business must have been met with some success, because by 1920 the couple were living in their own home, with Johanna staying at home while Max worked, and Max owned his own shop. A decade later, however, Max no longer owned his own business and was listed as a designer of women's apparel at a local store. The custom ladies' tailoring business had faded away in favor of specialty boutiques and department stores selling ready-made merchandise by this time. 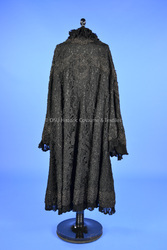 The garment with the Max Pollatsek label is an elaborate evening coat of black lace and braid over black silk satin. The edges are trimmed with pleated black silk chiffon around the neckline, down the front of the coat, around the hem, and around the edge of very wide bell sleeves. The coat also contains a velvet tie at the neck. 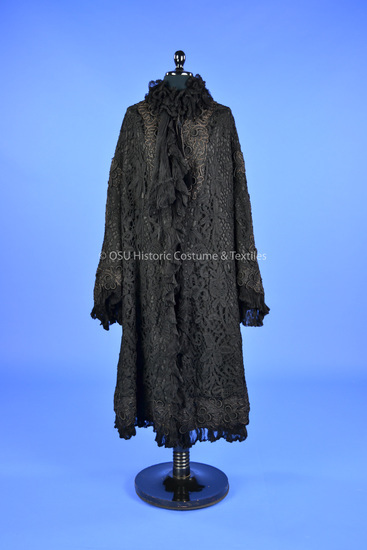 Overall lace garments such as this coat were the height of fashion between 1905 and 1910. The coat was donated by Elizabeth Shedd Mykrantz, and either her mother, Agnes Jeffrey Shedd, or mother-in-law, Alice McCormick Mykrantz, could have been the proud owner of this ornate coat.